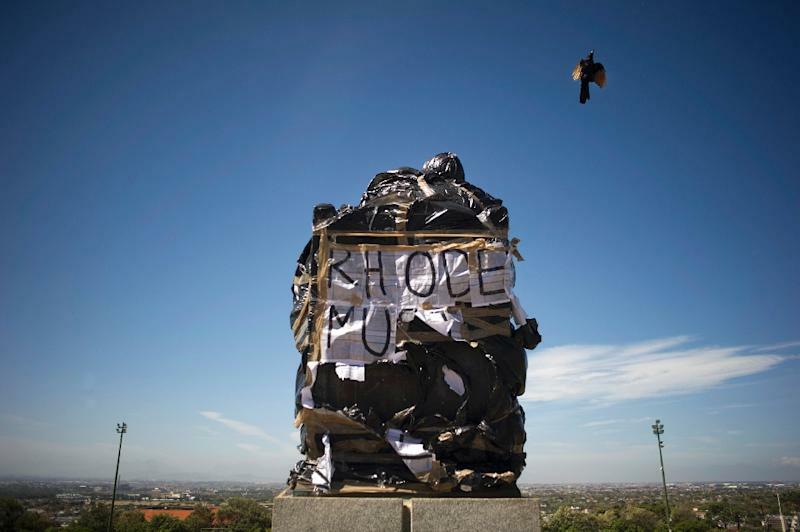 Cape Town (AFP) - A bucketload of human excrement flung at a statue has toppled a symbol of British imperialism in South Africa, marking the emergence of a new generation of black protest against white oppression. 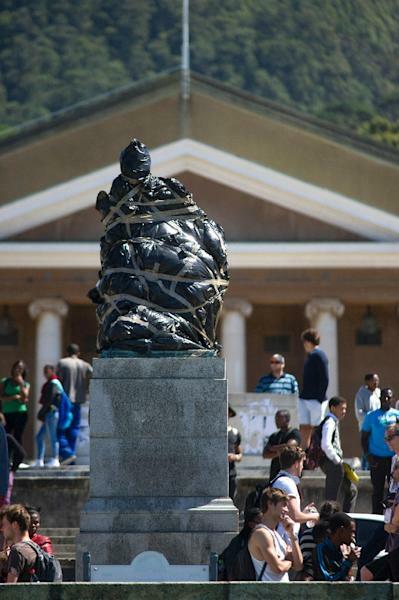 The senate of the University of Cape Town (UCT) on Friday bowed to student demands that a brooding bronze statue of colonialist Cecil John Rhodes should be removed from the campus. UCT, the oldest university in South Africa and regularly ranked as the best on the continent, was built on land donated by Rhodes, a mining magnate who died in 1902. Many of the students involved in the protests never lived under the injustices of white minority rule, but say they still experience racial discrimination 21 years after the end of apartheid. The large statue of a notoriously racist Rhodes gazing across an Africa that he coveted for the British empire made them feel alienated on a campus still dominated by white staff, they said. The "poo protest" was launched by a small group of students earlier this month, sparking a series of demonstrations demanding that the statue be torn down. On Friday, the university senate voted 181 to one to remove the statue permanently from the campus, after vice-chancellor Max Price acknowledged "the many injustices of colonial conquest enacted under Rhodes' watch". While the university council still has to endorse the move at a special meeting on April 8, the statue will be boarded up until it is handed over to government heritage authorities, university spokeswoman Pat Lucas said. "It is certainly a victory for us," said student representative council president Ramabina Mahapa. "It means we are being heard by the larger community." 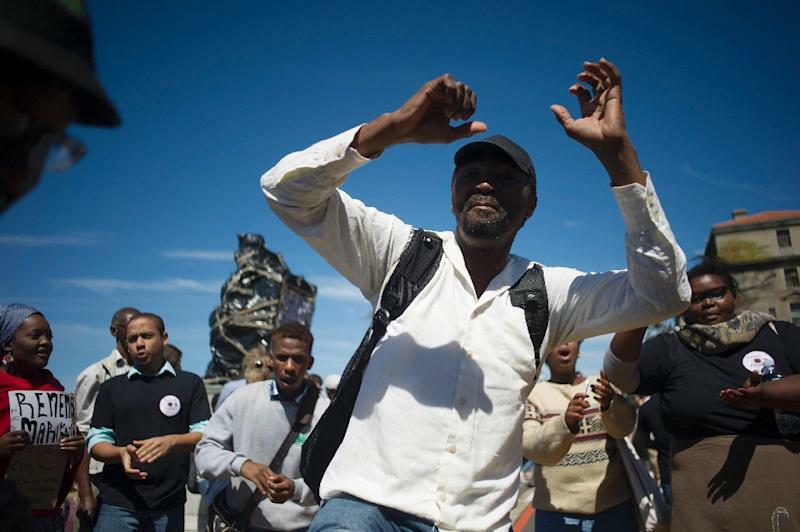 But the disappearance of Rhodes is unlikely to end the debate on racial transformation launched by the protest, which gave rise to similar demands for change at two other universities. In the east coast city of Durban, students at the University of KwaZulu Natal splattered white paint and anti-racism slogans on a statue of Britain's King George V.
And at Rhodes University in the Eastern Cape, activists want the institution to be renamed. The protests have also sparked lively debate among academics, historians, politicians and writers of letters to newspapers. Much of the debate has been surprisingly calm and thoughtful in a country with such a divisive history, but a bitter edge of racism lurks beneath the surface in Nelson Mandela's "Rainbow Nation". One white letter writer probably spoke for many when he suggested in the Cape Times that the student who threw the excrement at Rhodes should leave UCT and attend a university established by "his own ancestors". But students have dismissed the argument that Rhodes should be honoured for donating land for the campus, saying he stole it from black Africans in the first place. The discontent goes beyond symbols to cover admission policies and the racial make-up of the teaching staff. Eusebius McKaiser, an author and commentator who attended Rhodes University and won a prestigious international Rhodes Scholarship to Oxford University, summed it up in an opinion piece in the New York Times. "South African universities remain a testament to the country's colonial heritage in terms of what they teach, who does the teaching, and the morally odious symbols that haunt our campuses or lurk in their very names. "At Rhodes, 83 percent of senior management staff remain white and 77 percent of 'professionally qualified staff,' a category that includes academic teaching staff, are white," he said. Whites make up about eight percent of South Africa's population of some 54 million. McKaiser, who is of mixed race, defended the fact that he accepted a Rhodes scholarship, telling a radio interviewer that in moral terms the colonialist's money belonged to "the millions of black South Africans whose rights were trampled on". He took the scholarship to Oxford "so that I could come back and show the middle finger to his legacy," McKaiser said. Since the end of apartheid the names of some cities and streets deemed offensive have been changed, but monuments to South Africa's racist white-minority rule remain scattered throughout the country. Much of that can be attributed to the racial reconciliation policies of liberation hero Nelson Mandela, who became the country's first democratically-elected president in 1994. Another former Rhodes scholar, Shaun Johnson, wrote in South Africa's Times newspaper of his surprise when Mandela agreed in 2002 to have his name coupled with that of Rhodes in a new charitable organisation. The Mandela Rhodes Foundation, of which Johnson is now executive director, provides post-graduate scholarships to young Africans. "Mandela told us to expect controversy and embrace it, while remaining certain in the knowledge that what we were actually doing was what mattered," Johnson wrote. "He said... whenever possible, we had to put history to work for a better future." Arts and Culture Minister Nathi Mthethwa echoed Mandela's approach in his response to the UCT protests. "The government's attitude and policy to all heritage sites -- including statues of former imperialists like Cecil John Rhodes, among others -- is based on a national policy of reconciliation, nation-building and social cohesion," he said.